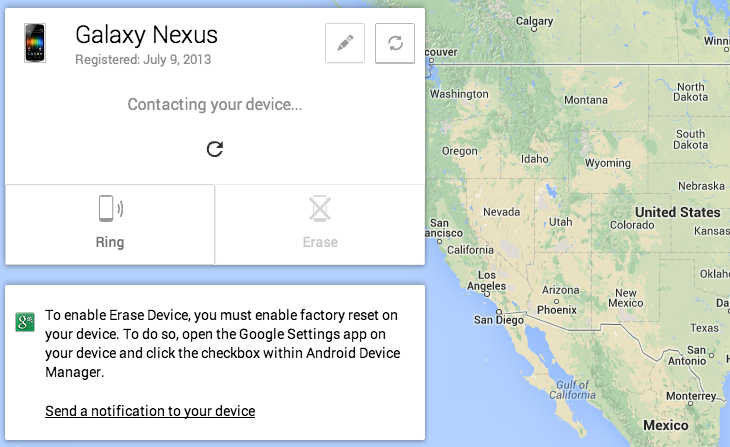 Google calls its new Android device location and remote access service Android Device Manager. This has been a feature that has been missing from stock Android for a long time that has been filled with a host of 3rd party apps, but it is nice to finally see a free stock Android solution. It is also interesting to note that this did not require any sort of update – Google Play Services is indeed quite powerful and can allow new features and services to be deployed without any updates to the OS itself. The service allows you to locate your device, cause it to ring for up to 5 minutes (even if it is on silent or vibrate mode), and to wipe the device remotely. In order to wipe the device remotely you must first enable a remote factory reset by going to Google Settings → Android Device Manager → Check Allow remote factory reset.